Thomas Krens’ model train museum, proposed for Heritage Park in North Adams, is acquiring touches of tangibility. Here I’ll report on some of the ways the project is taking on a tangible aspect and presence, accumulating tangible assets and promising tangible benefits, providing tangible evidence of what may grow into a world-class attraction. One manifestation of the project’s substantial appeal came out of Tom’s presentation at a “Northern Berkshire Economic Summit” in July. Massachusetts Secretary of Housing and Economic Development Jay Ash was in attendance, offering vocal as well as material support to the vision expressed. The meeting was covered by iBerkshires and The Berkshire Eagle. Then the the August issue of Berkshire Magazine hit the streets with a cover photo of Tom with two ex-governors, Michael Dukakis and William Weld, who have gotten on board with the model trail project in a big way, based on relationships that go back to the founding of MassMoCA. You can read the whole story here. Then a display went up at MassMoCA that suggests the scale and precision envisioned for EMRCA. In between MoCA’s largest gallery and the Sol Lewitt exhibition is an atrium with catwalks connecting the buildings. At three stories high, it’s one of the few spaces that could accommodate a 31-foot-high mock-up of the Empire State Building. 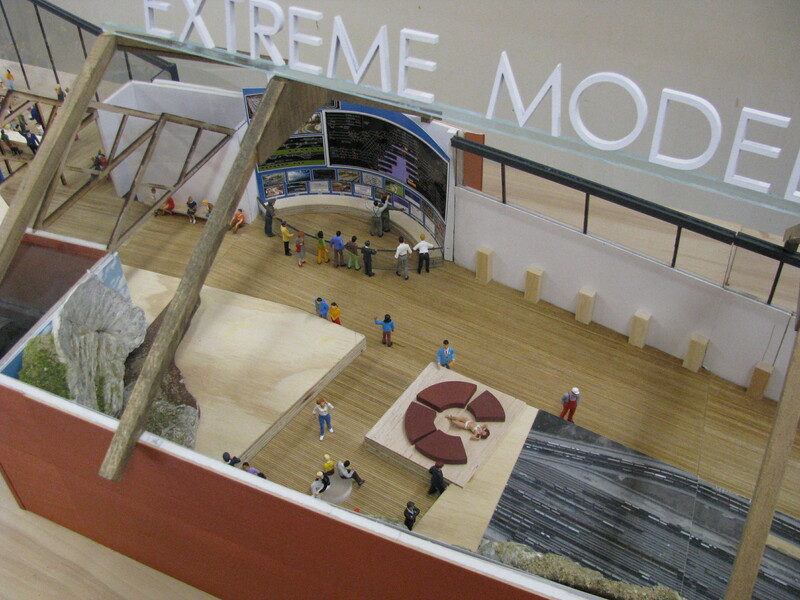 Here’s how the Extreme Model – or Gigantic Miniature, as I prefer to call it – will appear in EMRCA’s O-gauge 1:48 scale. See more photographs and commentary about this installation by clicking “Continue Reading” at the bottom of this page. Simultaneously, progress is underway on the prototype for the design and construction of the model train set-up of EMRCA. Here’s a taste of what the roundhouse will look like as one of the centerpieces of the exhibit, under construction as the place where 24 locomotives will converge. More photos and captions about the prototype after the break.